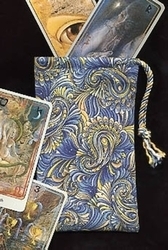 It's charming, bold, with just a touch of whimsy � this tarot bag embodies a free spirit. 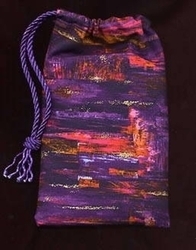 Its lively purple and green paisley pattern seems appropriate for a person who follows no one's lead. A garland of flowers graces the inside of each paisley, accented with small metallic gold dots. Paisley as a symbol is believed to come from the Persian droplet motif, the boteh. 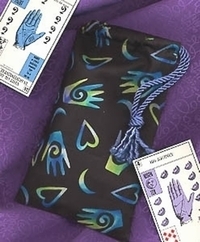 It's a combination of a bent cypress tree � a Zoroastrian symbol of life, strength, and eternity � and a stylized floral spray. 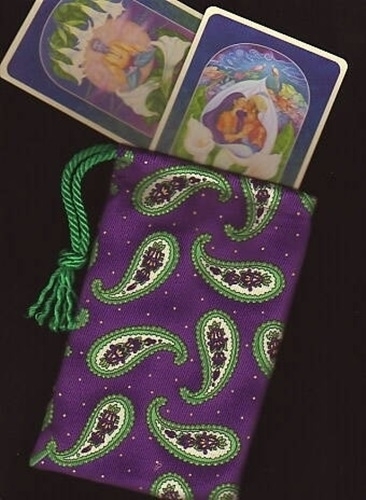 Pictured is the Free Spirit Tarot Bag with cards from the Power of Flowers deck, which has floral themed cards that are almost all illustrated with some shade of purple or green. 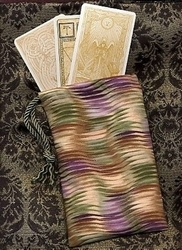 Decks that are great matches are the Rumi Tarot, the Faerie Tarot, the Gilded Tarot, the Halloween Tarot, and Tarot of a Moon Garden.